Africa wants more money from rich countries. Global warming is the new means of achieving it. 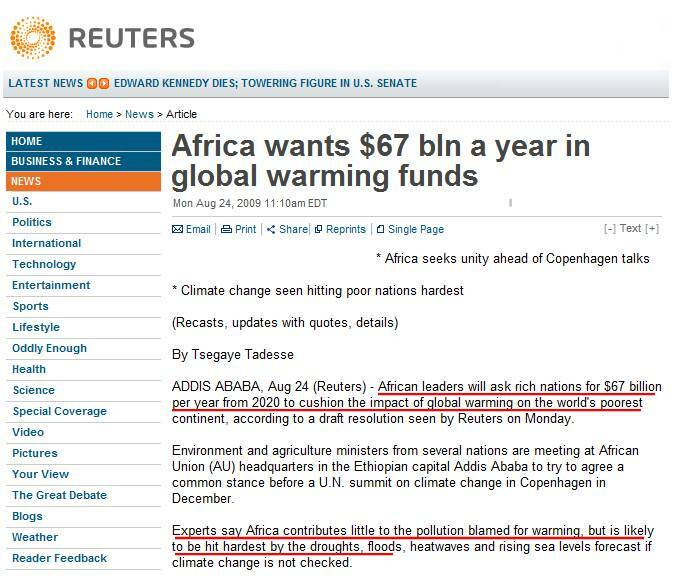 The above Reuters article states: “Earlier this year, Ethiopian Prime Minister Meles Zenawi called on rich countries to compensate Africa for warming, arguing that pollution in the northern hemisphere may have caused his country's ruinous famines in the 1980s”. The GHF is composed mainly of ex-UN officials for the purpose of increasing money flow to Africa. The following figure combines two figures from the GHF report. The top figure shows the producers of CO2 while the lower figure shows the expected negative impacts of CO2. In other words the US should pay Africa a lot of money. The GHF’s blame game completely ignores Africa’s CO2 emissions from deforestation and biomass burning. The map above also downplays the fact that China is the largest emitter of greenhouse gases. It’s all the US’s fault for being rich. 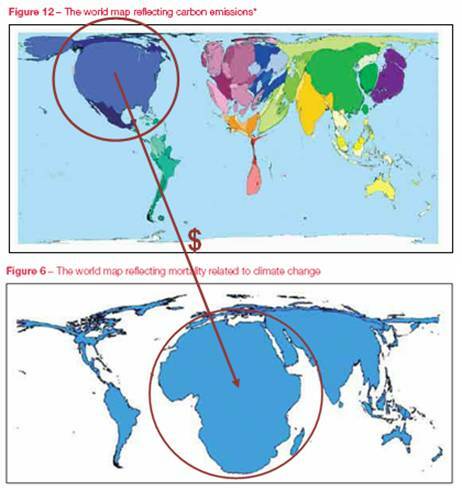 The sob story is that African countries and other poor nations need more money because they will be impacted the most due to CO2. But this doesn’t match reality. 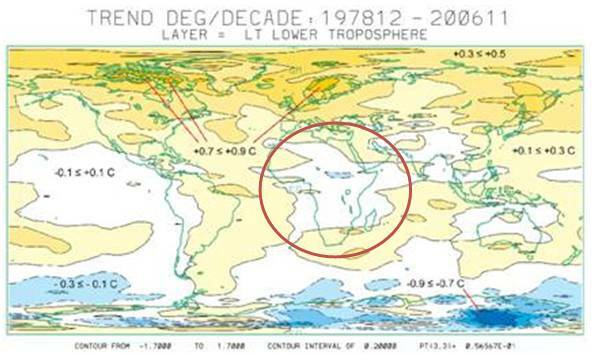 The following figure shows the global temperature change from 1978 to 2006 from satellite data [http://climate.uah.edu/25yearbig.jpg]. The following figure is from the UN IPCC Fourth Assessment Report (AR4) Figure 9.6 (2007) [http://www.ipcc.ch/pdf/assessment-report/ar4/syr/ar4_syr_spm.pdf]. It shows the change in temperature (C per decade) by latitude. 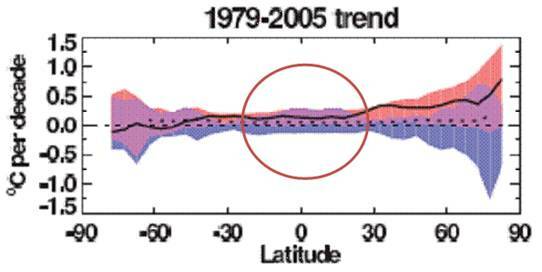 The black line shows the observed temperature, the blue band shows the output of the computer models including only natural factors, whereas the pink band shows the output of computer models including anthropogenic CO2. 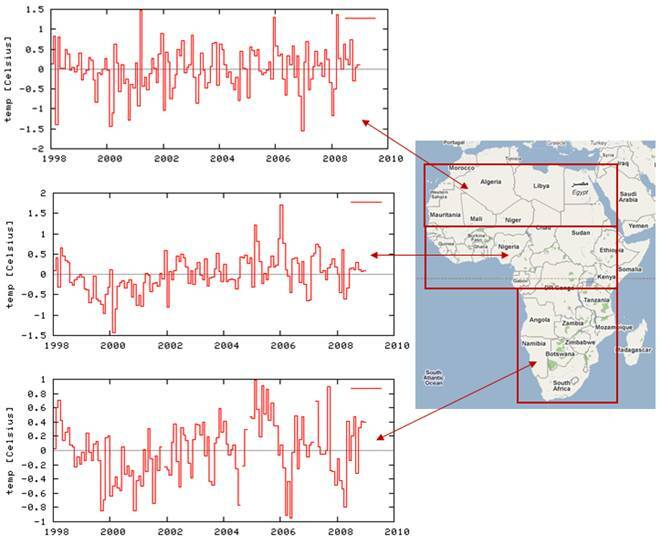 Notice that the models without CO2 (blue shaded area) can explain all of the warming for most of the world up to 30 degrees north latitude, including Africa. In addition, the warming in the tropics is minimal. While the MDGs may be laudable – reducing poverty around the world is a great idea – they should be funded on an honest basis, not under the artificial guise of “climate change”. An interesting coincidence – now that Obama is president, the African Union came up with a need of $67 billion per year – very close to the $65 billion per year that Obama’s Global Poverty Relief Act would have provided if it had passed.